This five strand necklace is strung with a rich mix of beads dominated by red, orange and purple spiny oyster and including lapis lazuli. 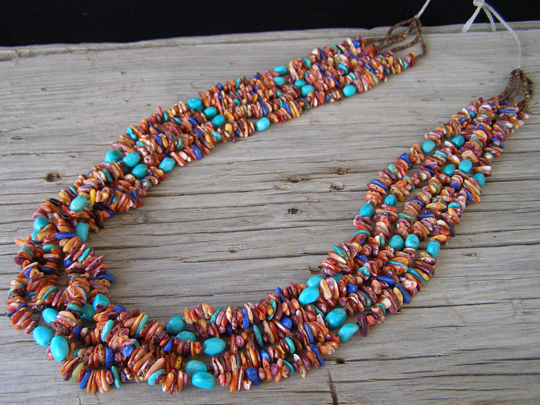 In addition, Irene created banded stripes formed by nuggets of Fox turquoise throughout the length of the necklace. This is archetypal Fox turquoise in its unique blue-green coloration. In traditional fashion, the braided beading string is simply tied off in a bow and no metal hardware is used as a catch. Length of the necklace cited below is the measured length at which it is tied in the photographs, but this necklace could be tied at any length from 31" to 42". Not only is this a beautiful color combination, this is strung with the skill that lends Irene's necklaces their silky movement. Length (as tied in photos): 38"